Kidneys are reddish bean shaped organs of the urinary system. Kidneys are two in the number and present one on either side of the vertebral column. 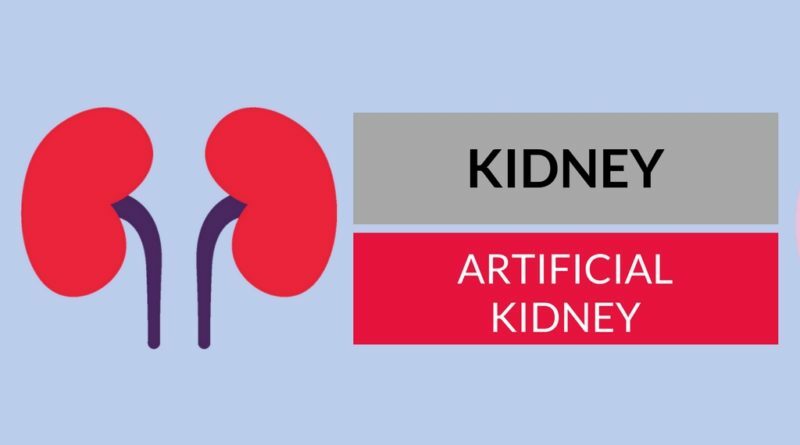 Each kidney is about 11 cm long, 6 cm broad, and 3 cm thick and weighing about 150 g. In modern period, artificial kidneys came into existence to help the people who are suffering with kidney failure. This article mainly concentrates on communicating the differences between kidney and artificial kidneys. The natural kidneys are responsible for the excretion of nitrogenous waste products produced in the body. Kidneys excrete water from the body. Kidneys help in maintaining the water balance in the body. Certain drugs and toxic substances present in the blood are eliminated by kidneys. Artificial Kidney is the man made a device to replace the kidney in case of kidney failure in humans. The device will be implanted in the abdomen and is powered by the heart is designed to filter the blood and perform other kidney functions, helps in control of BP, production of hormones, etc. Kidney is the naturally developed excretory organ located in the body of humans. Artificial kidney is the man-made device. Excretion of urine by kidneys is done naturally when body fluids are filtered. Artificial kidneys are use it to dispose urine in patients who is kidneys are completely damaged. Kidneys have the capacity of reabsorption to maintain iconic balance in the body. Artificial kidney does not have the reabsorption capacity to maintain iconic balance in the body. Functioning of kidneys is stimulated by the nervous system and hormones in the body. The functioning of artificial kidney is done with the help of the machine. The natural kidney continuously receives the blood and water, filter them and keep the body away from toxic wastes by the process of excretion. The artificial kidney is the device used in kidney damage persons only from time to time, under supervision of a specialist doctor. Kidneys are made up of nephrons. Artificial kidneys are made with cellophane tubes. Kidneys are the chief excretory organs in the body. Each kidney is made up of approximately more than 1 million nephrons. The kidneys have very great reserve power. If one kidney is removed due to damage or disease, another kidney takes up function of both the kidneys. The total amount of urine excreted per day is about 1.6 L to 1.8 L.